. 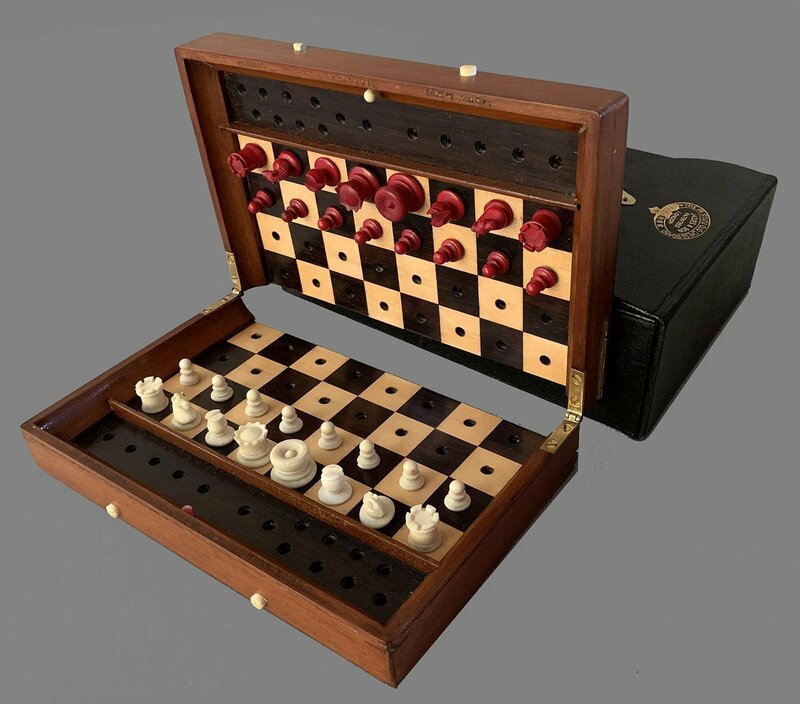 The Jaques Type II Status Quo Chess chess set features a hinged folding board with an ingenious patented locking system. By depressing two bone buttons located at each half of the chess board, the pieces are locked in place so the game can be halted midway and stored for a later date with the position kept in tact. An additional inside button unlocks the pieces. 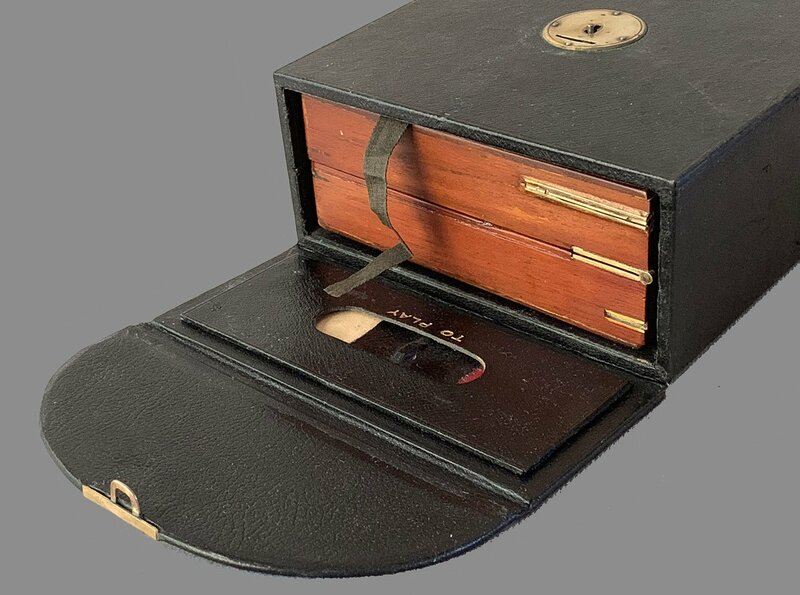 The exterior sides of the Mahogany case have a brass slider which locks the board into an open position when playing. 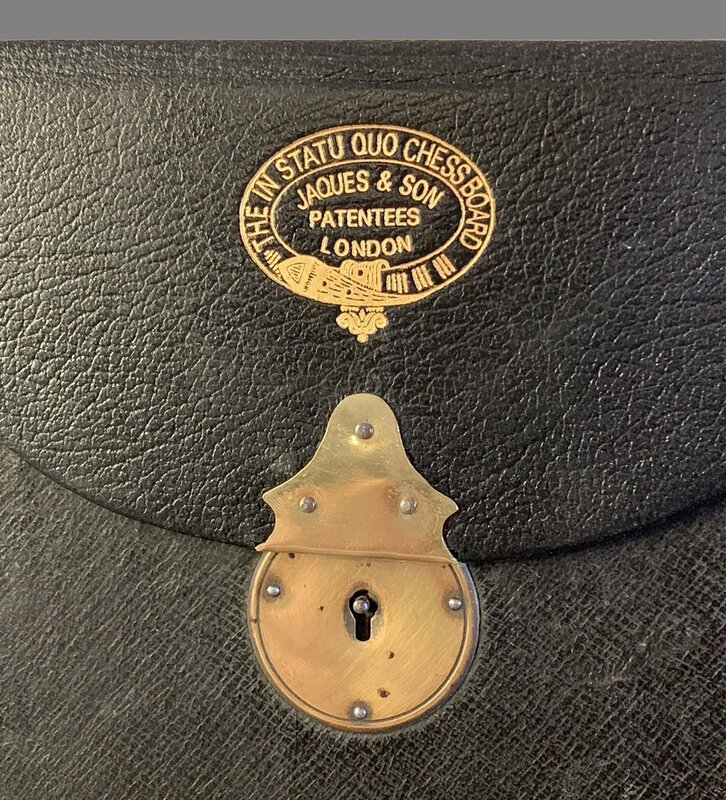 The name “Jaques London” is imprinted along one edge of the frame. 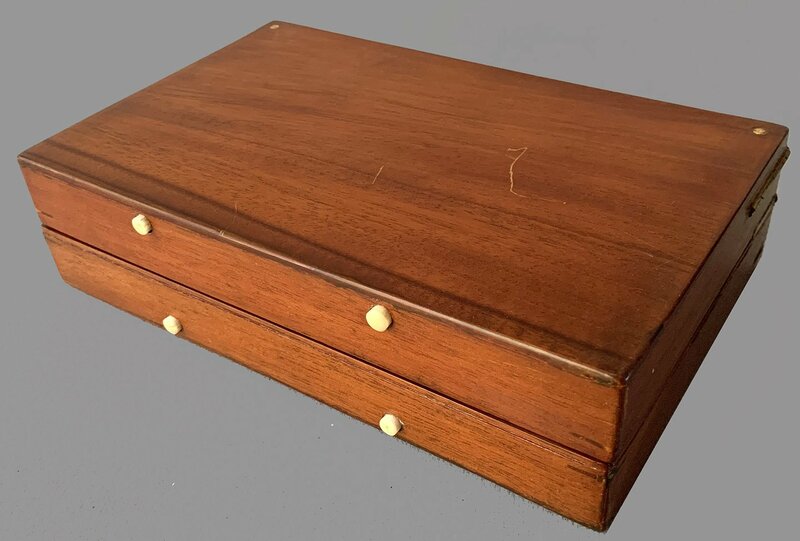 The Rosewood and Holly chessboard is housed within the Mahogany frame. 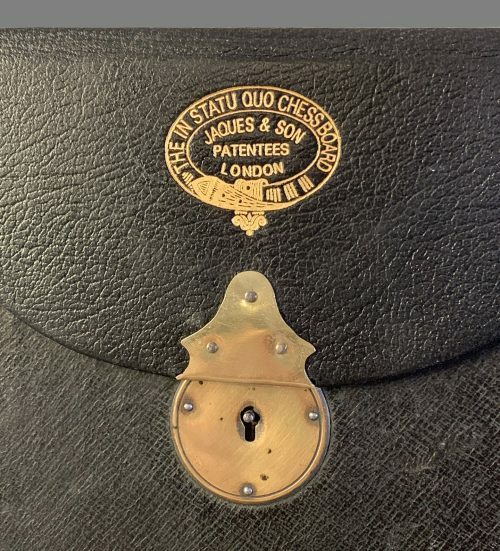 The Type II Status Quo Chess set has its original black leather case with a gold-embossed manufacturer’s label affixed to the the flap. 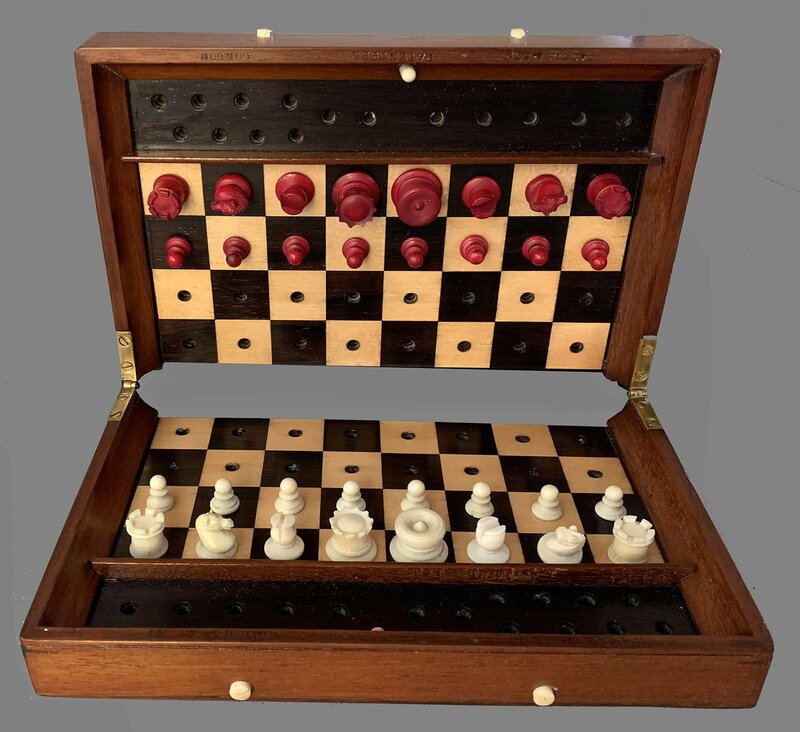 The chess set and leather slip-case are in excellent condition. 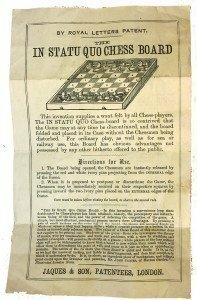 The Jaques patent application is dated 1st July 1853 and was submitted on 2nd July. The patent was granted on 16th August 1853. Jaques produced In Statu Quo portable chess sets in four basic sizes. These were available in either Red-stained and natural Bone or African ivory. Each chess set came housed in a Black leather carrying case with a lockable flap covering the small end of the case. The lockable outside of the flap had a gold embossed Jaques manufacturer’s emblem. To facilitate remembering which side had the move when the game was paused, there was a slider on the underside of the flap which would show either a red or a white swatch. Each case originally had a pull-ribbon to aid removal of the chess set. Few of these ribbons survived. The most common of the In Statu Quo chess sets, measured 9-1/8″ x 9-1/8″ with bone or ivory chessmen. They had a King height of 5/8″ by 7/8″ in diameter. These came in two black leather case configurations. One was a rather typical parallelepiped, (Type 1A). 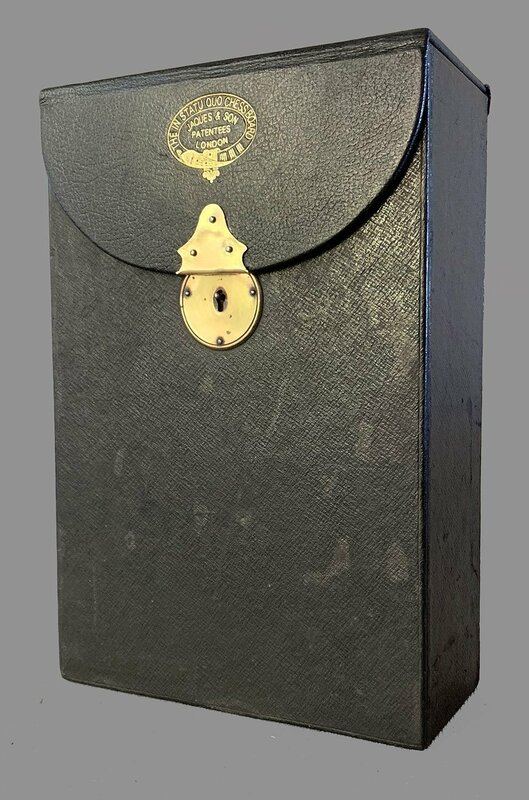 The second, which is the configuration of this set, had a rounded spine with a small flap atop the spine to insert the captured chessmen (Type 1B). The next size, and probably the most practical, the Type II, measured 11-1/2″ x 9-1/8″ and used the same bone or ivory pieces as the smaller In Statu Quo sets. The major difference between this and the smaller sets was the extra field at each end to store and secure the captured chessmen. 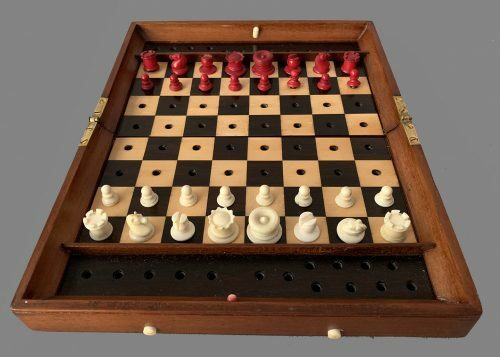 This is the configuration of the Ivory Type II Status Quo Chess set offered here. There were two larger size In Statu Quo portable chess sets. One, the Type III, measured 12-5/8″ x 12-5/8″ with bone or ivory chessmen having a King height of 3/4″ by 1″ in diameter. There was only one black leather carrying case configuration. 12-5/8″ with the same bone or ivory chessmen as the set above. These came in a rather distinctive leather case configuration. 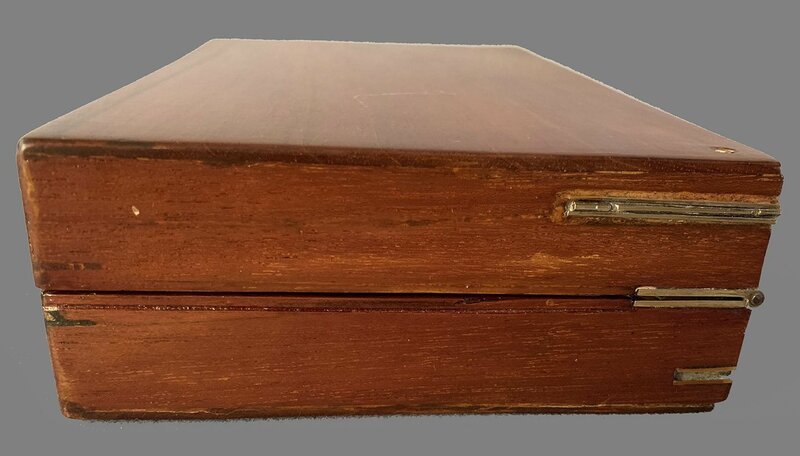 It was a typical parallelepiped, but with its lockable flap covering the long face of the case. 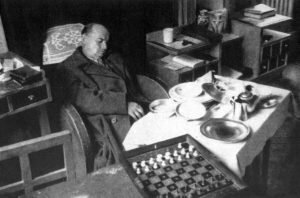 This is the set pictured in the “Death Photo” of Alexander Alekhine shown.